Check out the design-build office fitout by Huron Building Co. did for Motor1.com. I'm happy to say the Sherman Street Addition is coming along nicely. 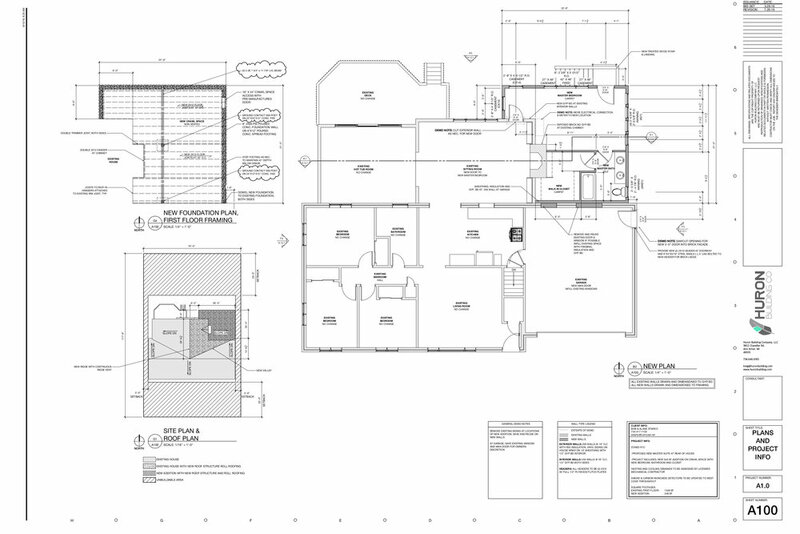 The design involved moving the kitchen to the new space and centering it inline with the existing fireplace. With the new room in the existing house we were able to expand the dining room and add a butler's pantry. Upstairs we added a luxury master suite with a deck. Mick Silkworth of Silkworth Build is doing a great job, along with CMR Mechanical out of dexter. The client was originally looking for a new studio addition to help the transition from a career in the performing arts to a retirement. In the end we decided to turn the existing bedroom into the studio and add a new master suite. I was able to stop in this week and see the construction, the project is moving along nicely and the owner is thrilled. Built by Second Edition, Inc. This is a house that I designed about a year ago for a couple who wanted a weekend retreat. It was an incredible experience to attend Vine and Dine 2015 at the Ann Arbor Art Center. It seemed that everyone was having a great time and enjoying hors-d'oeuvres by LENA. Amanda Mae was there to capture the whole thing. I designed this small lake cottage as a second home in Lyndon Township. It was a generous lot for a lake however there were a lot of trees we did not want to disturb. The footprint is the product of the site constraints. 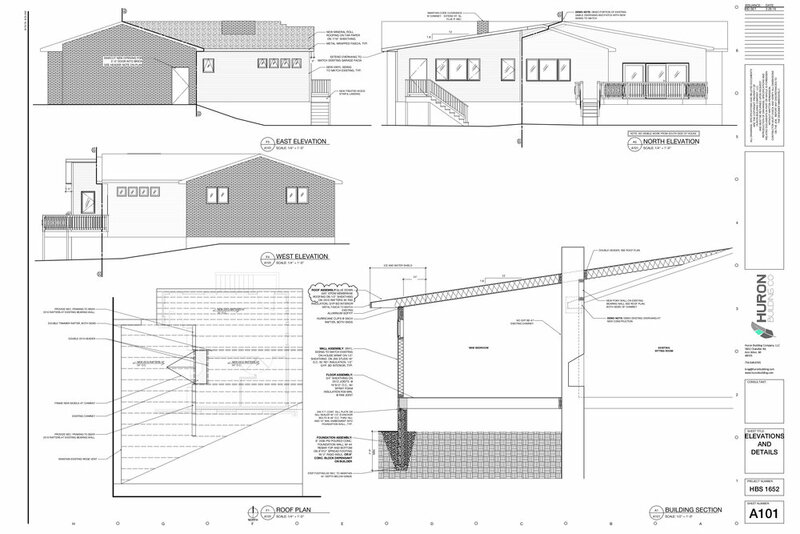 I spent some time in the last few days working on the schematic design for the Green Road Addition. I put together a pretty simple schematic massing and then spent a bit of time in photoshop adding the entourage and lighting. Around Christmas time I spent a few days working on a design entry for the POP X festival pavilion design. This was a great chance to flex some design muscles. For this journal entry I'm going to focus on my train of thought while laying out a set of drawings that are meant to explain how a concept could be constructed to create an experience. I went up to the shop a few days ago to cut out the pieces for the POP X prototype pavilion. Here's a quick shot of how the CNC works. Many thanks to Josh and Kurt at APE CNC for their help. APE CNC and Huron Building Company join forces to create the pavilion for the POP X Ann Arbor Pavilion Prototype. I was asked awhile back to do a 4 axis prototype design for Automated Precision Equipment CNC. HBC finally has its photo studio up and going so I thought it was time for a proper post showing what a 4 axis CNC machine can do. Joslin Lake Cabin is a small cottage located on an old bible camp. The vernacular of the existing buildings is very simple and campy, Its like being in a Wes Anderson film. This new cottage will fit that look. 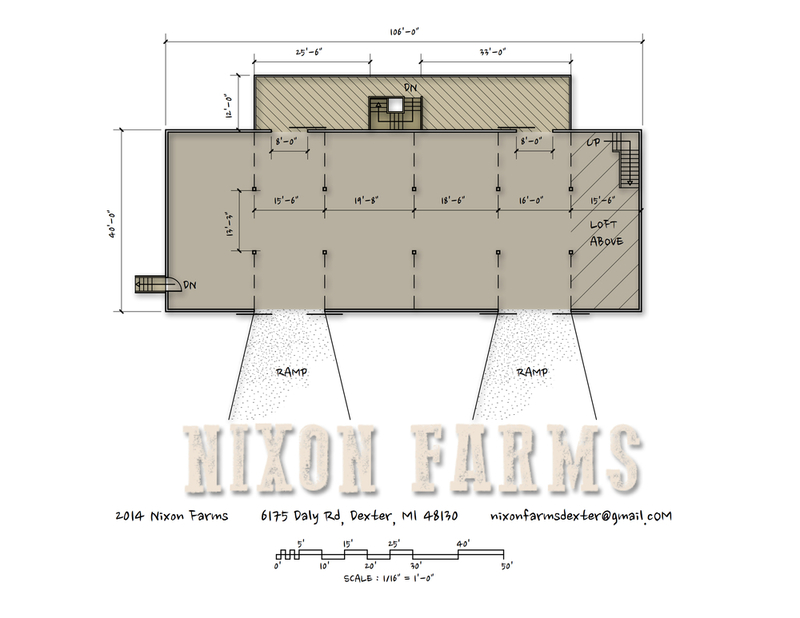 I was contacted by Nixon Farms to do a quick schematic sketch of his events barn. This is a great venue for a wedding.